Are you shopping for a new mattress? There are many mattress types available, but if you want one that adapts to your body weight and sleeping style, then the Leesa Cool Memory Foam Mattress must be in your short list. Whether you sleep alone or you have a partner, this mattress will help you get a sound slumber. The Leesa memory foam mattress has been getting a lot of positive press recently. The consensus is that it is the best mattress today, particularly when compared with other foam mattresses sold online. Many online reviews also indicate that the mattress is reasonably priced, as it is about 33 percent cheaper than the leading memory foam mattress brand. And should you proceed with your purchase of this memory foam, you will also help the company behind it help other people. Leesa has this program called One-Ten, wherein they donate one mattress to a poor family for every ten mattresses they have sold. That’s just one of the several good reasons why you should consider getting the Leesa Memory Foam Mattress. This mattress is available in various sizes—queen, full, twin, king, California King, and twin XL. Regardless of the size you buy, the mattress you’ll get has three layers of high quality foam. 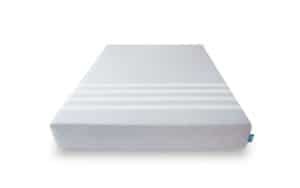 At the base of the mattress is a six inch, high density support foam that provides a supportive foundation. The middle layer is two inches of memory foam, while the upper layer is two inches of Avena foam. The latter is actually a polyurethane foam yet is bouncy and cool, so you won’t have to wake up hot in the middle of your sleep. It is also more durable compared to latex foam. Then there’s a four-stripe cover made of poly-lycra blend. It feels and looks good that you may not even want to put sheets on it. Lycra is the material often used in performance sports clothes and is known for being durable and breathable. The company, though, highly recommends the use of a hypoallergenic and waterproof protector to shield the mattress from spills and stains that can ruin its look or worse, damage it. 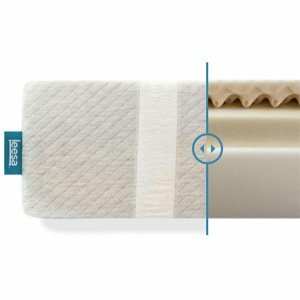 The Leesa Cool Memory foam mattress is right in the middle between soft and firm. If we are to rate it in terms of firmness (10 as the firmest and 1 as the softest), then it should be somewhere between 5 and 6. When you lay down on this mattress, you’ll initially feel some softness hug around your body. Then the memory foam starts to conform to the unique shape of your body, giving you a comfortable rest without the notorious “sinking” feeling that memory foam mattresses are known for. The mattress will slightly sink in any position you take, whether you’re lying on your stomach or on the side, but not to the point that it would irritate you. The mattress is designed for all types of sleepers. Whether you prefer to sleep on your back, stomach, or the side, you will be able to sleep comfortably on this mattress. The unique combination of softness with hugging support makes the Leesa Cool Memory foam mattress different from other mattresses you have slept on. There’s also no motion transfer that happens when you sleep on this mattress. That’s good news if your partner is notorious for tossing and turning around, as you won’t get disturbed by his or her movement. Leesa backs up its mattress with a 10-year warranty. The 10 year limited warranty means that you can have the mattress replaced or repair if there’s a manufacturing defect. This warranty covers all parts of the mattress. It particularly covers deterioration of the mattress, resulting in at least 1 inch of indentation, as well as any physical defect in the craftsmanship of the product that leads to irreversible damage of the memory foam. It also covers any physical flaw in the craftsmanship of the cover, including the zipper assembly. But it does not cover damage due to improper bed frame, physical abuse or damage to the structure, and normal increase in the softness of the memory foam, which according to Leesa, is normal. Moreover, it would still be up to the manufacturer to determine if your claim is warranted. But then again the warranty becomes void if the mattress leaves the United States, Canada, or the United Kingdom. 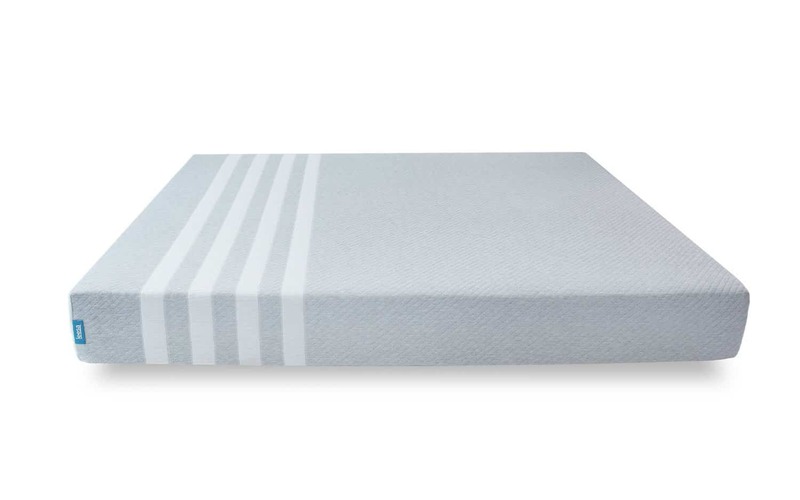 If we are to base it on reviews on Amazon.com, then we can easily say that this is a highly rated memory foam mattress. One reviewer says this mattress has a good balance between comfort and firmness. She describes herself as petite, weighing around 120 pounds and standing less than 5 feet and 5 inches. Her husband is bigger, a six-foot tall guy who weighs more than 200 pounds. She says both of them are fit people with high muscle mass, so they tend to “sink in” to their mattresses. Yet she says that the Leesa mattress is the best mattress that they have ever owned. A side sleeper, she says that she has slept well ever since they bought the mattress. She no longer has to put a rolled tower under her side to prevent swaying in her side. Her husband, on the other hand, likes the mattress as well as he no longer feels sore in the morning. He notes that the mattress isn’t too soft for his taste, and provides enough support to his back. Moreover, the lady who wrote the review said that they found the price of the mattress to be very reasonable. For that, she gave the mattress a high 5 out of 5 stars rating. Another satisfied owner is a 30-year old man who has been complaining of back pain the past three years. He says he has been looking for a mattress that isn’t too soft, but not too firm as well. The Leesa Cool memory foam mattress, he says, is the right one for him. He says that when you sleep on this mattress, the firmness can be described as moderate. It’s relaxing, too, for his taste. He loves that it doesn’t feel like he is sinking when he’s on the mattress. The only complaint he has is that it isn’t the best when it comes to thermal regulation. Another reviewer calls the mattress a standard cushion. He says that it is very reasonably priced, which made her buy it. She likes that it is easy to set up, and doesn’t transfer movement at all. It also suits her well, being a side and stomach sleeper. The main beef she has with this mattress is the smell, as she finds the odor weird. She said she has gotten used to the odor, though.